When is a pie not a pie? When it’s Boston Cream Pie! Ever since Geni at Sweet & Crumby posted this recipe I’ve been wanting to make it. During the process I’ve discovered that I LOVE custard. Making the custard filling for this cake was the thing I was most nervous about. Fortunately it came together perfectly and I’m now searching for reasons to cook custard again. The cake was great and the kids were so excited to try it but the chocolate I used was a little strong so they were a little put off. Make the Cake: Preheat oven to 350 degrees. 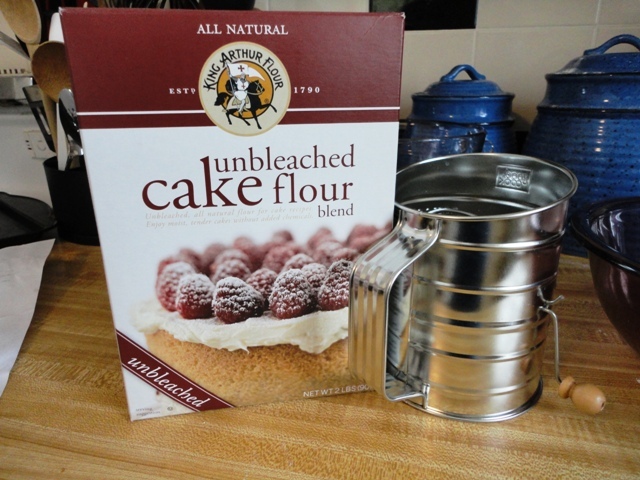 Prepare a 9-inch cake pan by cutting a circle of parchment paper by tracing the bottom of the cake pan. Then butter the pan, place the parchment paper on top of the greased pan, and then butter the parchment paper as well. Flour the entire pan and knock the pan upside down over the sink to remove excess flour. Set the prepared pan aside. In a medium mixing bowl combine flour, sugar, baking powder, and salt. 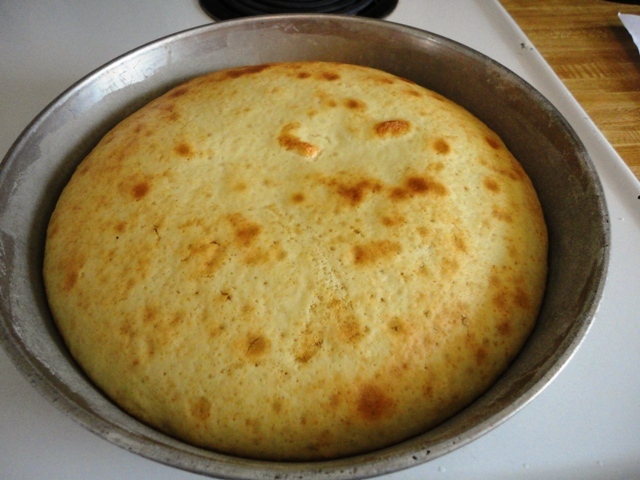 Make a well in the center of the flour mixture. Add milk, oil, egg yolks, and vanilla. Beat with an electric mixer on low to medium speed until combined. Beat an additional minute on medium speed and set aside. 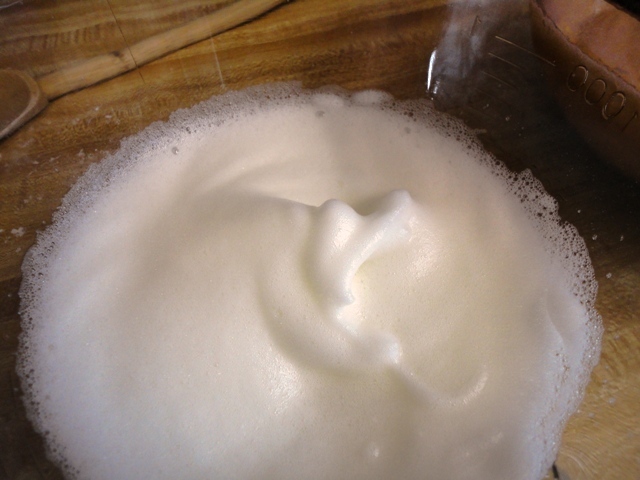 In a large mixing bowl, beat egg whites and cream of tartar on medium to high speed until soft peaks form. Pour the egg yolk mixture over the egg white mixture and fold in. Gently pour the batter into the prepared cake pan. Bake for 25 to 30 minutes or until the top springs back when lightly touched. Invert the pan onto a wire rack. Cool completely. 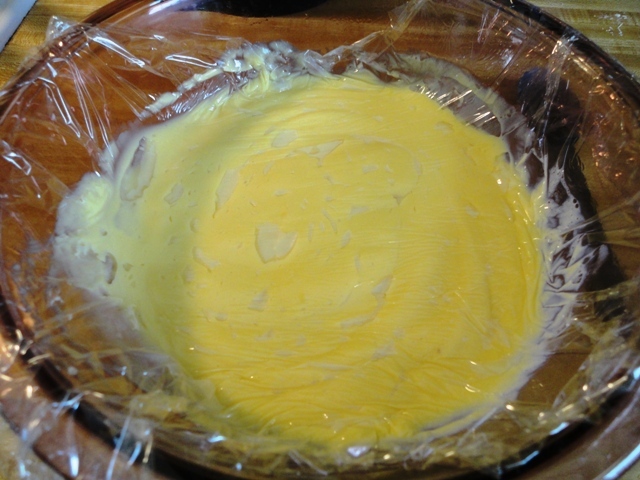 Make the Custard Filling: In a medium saucepan, heat the milk and vanilla to a boil over medium heat. Immediately turn off the heat and set aside for 10 to 15 minutes. In a bowl, whisk the egg yolks and granulated sugar until light and fluffy. Add the cornstarch and whisk vigorously until no lumps remain. Whisk in 1/4 cup of the hot milk mixture until incorporated. 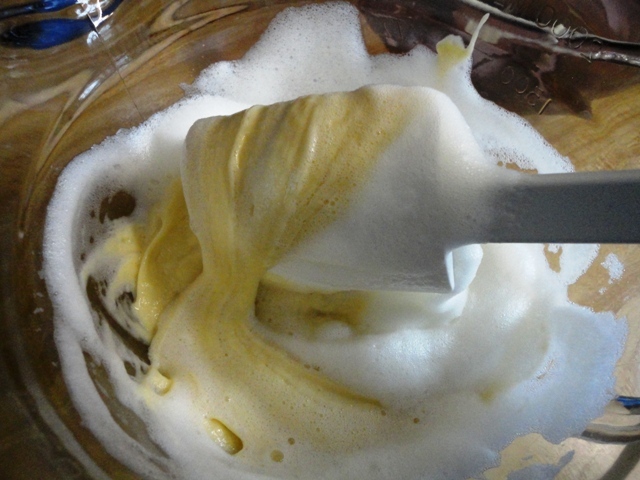 Whisk in the remaining hot milk mixture, reserving the empty saucepan. Pour the mixture back into the saucepan. Cook over medium-high heat, whisking constantly, until thickened and slowly boiling. Remove from the heat and stir in the butter. Let cool slightly. Cover with plastic wrap, lightly pressing the plastic against the surface to prevent a skin from forming. Make the Chocolate Ganache Topping: In a medium bowl, pour the boiling cream over the chopped chocolate and stir until melted. To assemble pie, remove the cake from the pan. Cut the cake in half horizontally. Place bottom layer on a serving plate or board, and spread with the custard filling. (Don’t worry that you have extra custard. Just eat it.) Top with second cake layer. Spread chocolate ganache over the top of the cake. Store in refrigerator. Now that I’m plotting to make more custard I need lots of good recipes that use all the extra egg whites I’m going to have. Don’t throw out the extra egg whites. I’ll share the recipe I find to use them up too so we aren’t wasting anything. I can understand why you just had to make this! Fabulous! Crossing fingers, I will be able to make it this weekend for friends. Your Bostom Cream Pie looks so perfect. 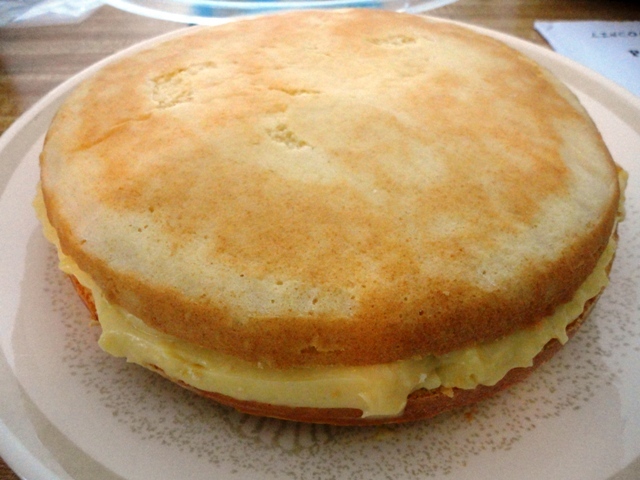 I love the sweet, fluffy cake with the cool and rich custard. The chocolate totally makes this…so rich and irresistible! Gotta have it. I’m more of a sweet than savory girl! Thanks for the shout out and yours looks perfectly fluffy and delicious! I may have to make it again sometime. What a great recipe. 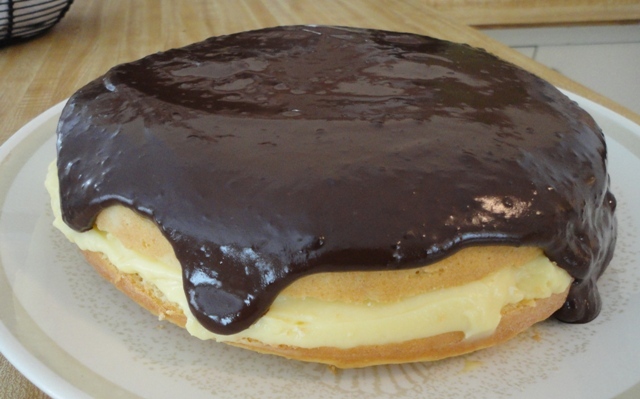 I can’t wait to try and make your boston cream pie, looks so good. I have never made my own custard before, I always but that custard powder and just mix it up on the stove, turns out good. Gonna try and make yours, see how I do. Thanks so much for sharing, hubby won’t believe me when I tell him that I have made and not bought his favorite. You make me want to reach out and grab a slice of that. I followed you from the foodieblogroll and I’d love to guide Foodista readers to your site. 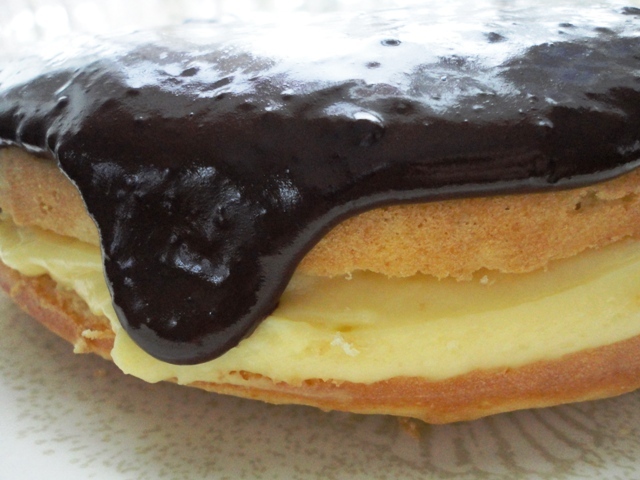 I hope you could add this boston cream pie widget at the end of this post so we could add you in our list of food bloggers who blogged about boston cream pie,Thanks!